Now a few weeks ago i was down the pub with my friends and I can’t remember exactly how it all came about but it became apparent that although seemingly enthusiastic none of them had really attended any motorsports events, in this case specifically drag racing. As the poorly organised bunch we are we had planned to go and watch the european finals. Main reason being we are all mussel car fans and it would probably be the perfect event to attend for their first drag race experience. Unfortunately this wasn’t to be, after a bit of research it was decided we would attend the USC show, and to be honest we were not disappointed. We only went for the day rather than the weekend, getting there early we were greeted by a big team of busy marshals keeping the traffic flowing meaning the queue was virtually none existent. Anyone who has been to santa pod before will know its a large site. Camping and parking on one side, quarter mile drag strip in the middle and a paddock / show area the other side of the track. One of the advantage of going to an event such as ultimate street car means you do get a huge range of vehicles from your Toyota starlet to the big dirty american V8 supercharged pick up trucks. Admittedly the Japanese car makers dominated the show with a huge number of RX7s, Evos and civics flooding the ground, not that this is an issue the work and time that has obviously been put into majority of the ca rs is just a testament to the passion that remains in the car scene despite the ever growing road restrictions faced by anyone modifying their pride and joy. As with any popular car show the big brands were out in force with the best they have to offer on exhibition. The alpine stand is something to behold, i mean the value of the sound systems in the cars they have on show is beyond my comprehension. The bass could literally be heard across the track and into the carpark! Highlight of the day on the track has to be the Fire Force jet car. Yes its exactly as it sounds, a funny car wrapped around a helicopter jet engine. Its not an event to be missed,i feel the commentator, who by the way is a great crowd pleaser, puts it the best. Imagine going to the airport to go on holiday, and rather than sitting in the airport lounge waiting for your flight, you’re sat by the runway watching the other planes take off. As the machine launches off the starting line you are hit with a wall of sound, heat and intense vibration and in under 7 second quarter of a mile has been eaten up at a speed topping out at 280mph on this particular run. I’m not sure who exactly it is sat under that shell, but i don’t think i would be fighting for his job. Of course when i came to take a photo my camera decided not to play along, however if you click on my Instagram icon at the bottom of the page i do have a short video. I think I’ve covered all the bases. I say its a must go for any petrol head. The commentator is always on the ball and knows everything about every car hitting the track. 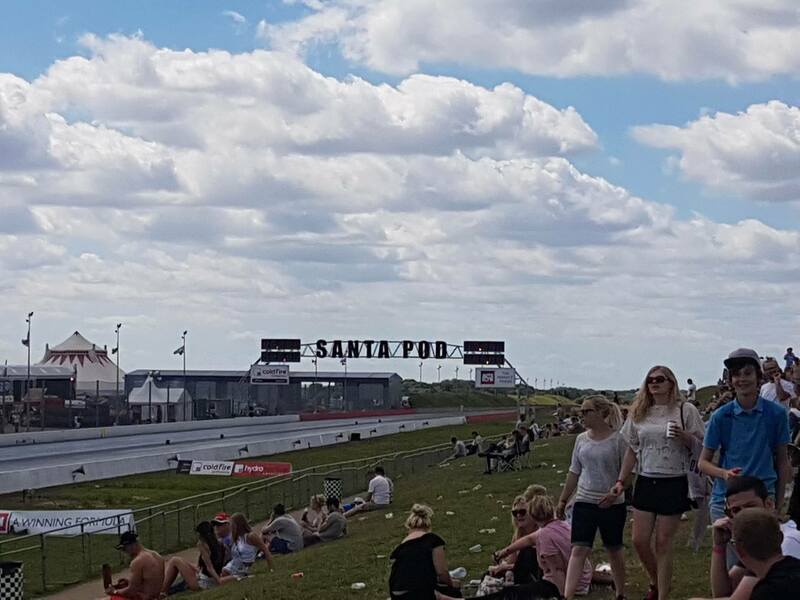 I’m yet to have any form of bad experience at Santa Pod. I’l be going back to the flame and thunder event in October. So if you don’t manage to get down yourself I’ll be doing a write up a few days later so you will be able to read about what you missed out on!